How does an adult get a discount for their OA event fee you ask? An adult leader who is the driver of the automobile gets a $5 discount for each youth they bring with them. Bringing 5 youth allows the driver to come free to the OA event. Not a bad deal. It helps get more youth to the events. This is a discount we give each Order of the Arrow weekend event. It does not include the winter banquet. If you register here, you do not pay then as it will not take it, plus you may not know yet how many youth you are bringing . You must pay at the event and tell them at check in how many youth you brought. JumpStart is for new Arrowmen who have been inducted into the Order of the Arrow. New members can catch a glimpse of the OA's rich history, discover more about their Ordeal experience, and learn how to seal their membership in the Order by taking the next step: Brotherhood Membership. Click here. 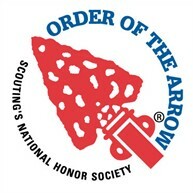 To stay connected and keep the Order of the Arrow active in your unit, every troop/team should have an Order of the Arrow Troop/Team Representative (youth position) and an Order of the Arrow Troop/Team Adviser (adult position). There are several low-cost high adventure programs available exclusive to OA members. OA Trail Crew (Philmont SR) OA Ocean Adventure (Sea Base), OA Wilderness Voyage and OA Canadian Odyssey (Boundary Waters), and new in 2014, OA Summit Experience (Summit Bechtel NSR) are each very special adventures. All have openings for next summer. If you have interest in any of them, check out the OA High Adventure website for more information.